I will do 25 Permanent Contextual Backlinks from TF 20-25 and DA 20+ Domain Authority for your Website for Solid Rankings. Now Its time to get rank your money site with 25 High TF/CF , High PA/DA and High PR Contextuals, these links are Gold Mine for your website, We have 50+ domains with domain TLD (.com, .org, .net) All are HighPr DoFollow attribute, these are best backlinks to Improve your website Ranking. Google Loves Contextual and DoFollow backlinks. We will crate the articles for these posts. All I need from you is your website link and up to 5 keywords. One order is for one link only, no splits. You need to send me one website link and up to 5 keywords. All you need to send me is your website link and up to 5 keywords. We will create and spin the articles. We do not accept custom articles. 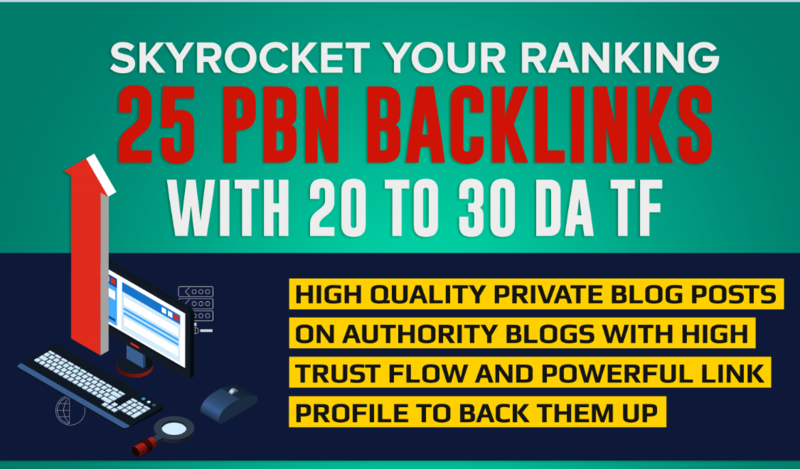 create 25 permanent PBN contextual backlinks with DA and trust flow 20-30 is ranked 5 out of 5. Based on 42 user reviews.